Our Custom Imprinted Big Bucket and Champagne Bucket will add a personal touch to your next party or coroporate event you have planned. These Custom Ice Buckets are made of a strong duable plastic that will never break and can be used again and again. You can order these Custom Party Buckets, just call 1-800-233-0828. 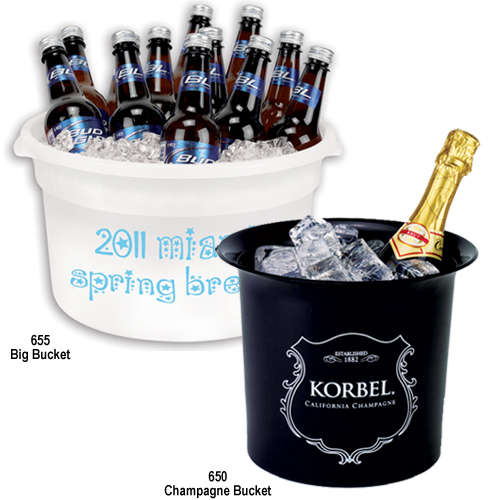 655 Big Bucket 5.95 5.85 5.75 5.55 5-1/2" 9"
650 Champagne Buckets 5.00 4.95 4.85 4.75 4-3/4" 6"
For additional information on our Custom Printed Ice Buckets or our other Bar, Restaurant, Night Club, and Catering Supplies, please contact us at 1-800-233-0828. Feel free to browse our other Customized Bar Supplies, including Custom-Imprinted Bottle Openers, Light Up Ice Buckets, and Custom-Imprinted Napkins.